Carnivals and festivals are very important traditions in Puerto. Such festivals are religious in nature and represent the fight between what is good and what is evil. It is a blending of Caribbean, Spanish and African customs. Rich in culture and heritage, vejigante masks, St. James the Apostle and the cities of Loiza and Ponce play very important roles in the vejigantes of Puerto Rico. There are three major festivals in Puerto Rico. They are the Carnival of Ponce, St James Festival, and the Hatillo Mask Festival of the Holy Innocents. The masks used for the Hatillo Mask Festival of the Holy Innocents represented the soldiers that killed the children of Israel at King Herod’s request. 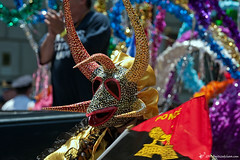 Vejigantes masks are significant for the Carnival of Ponce and the St. James Festival, also. Vejigante is known as a clownish character dressed in traditional colors which at one time were black, red, white and yellow. However, today, all bright colors are used. Vejigante masks or fright masks are paired with a costume in the form of a body suit with bat-like wings. The costume is complete with shoes, jingle bells and the cow bladder painted to look like a balloon. The origin of the word Vejigante comes from Vejiga means bladder and gigante means giant. As the vejigante runs the streets dancing and frightening individuals, ballooned animal bladders are used the beat away evil spirits. The St. James Festival came about from the Apostle James, who is the patron saint of Spain. St. James was one of the 12 Disciples of Christ. In the 12th century, it is said that St. James miraculously appeared before the Catholic militia and led them in battle against the Moors or Muslims and defeated them. At this festival, the Vejigante refers to the Moors. There are four main characters in the Festivals of St. James the Apostle. They are el Caballero or the knight, los Vejigantes and los Viegos are the elders, and las Locas are the crazy women. As St. James the Apostle evangelized to the Celtic peoples, the Virgin Mary appeared to him upon the Nuestra Senora del Pilar. She told him to build a sanctuary to glorify and honor God. All who came to visit would experience her blessings. Upon completion of the sanctuary, he was to go back to Palestine to die. Saint James was beheaded in 44 AD by King Herod. His remains were taken back to Spain and became a place of pilgrimage. Every year in the month of July, there is a 10 day festival as a tribute to his victory. The famed vejigante masks are made in the cities of Loiza and Ponce. Loiza was a small town in Puerto Rico populated by freed or escaped Africa slaves. Due to government neglect, it became a poor town. However today it is called The Capital of Tradition because certain types of Puerto Rican music originated there. The barrio is also famous for its artisans and dancers. It is considered a great tourist destination today. Loiza is famous for its coconut vejigante masks. Because of the extreme African influence in this town, these masks are made of coconut shells. The shell is cut as well as the nut and some of the coconut inside to make space for a human face. A monstrous looking face is carved into the shell and the teeth are created. The tongue is also made of coconut shell. A cape is added at the end. These masks with large horns, big eyes and huge lips and noses represented demons. The Festival Vejigante de Ponce is set in Puerto Rico’s second largest city. Every February prior to lent, the vejigante de Ponce takes center stage during the festival and the celebration is six or seven days in length. A vejigante mask made in Ponce differs from Loiza because it is made of paper mache. This process is simply dipping paper strips in a glue mixture and molding it. These molds dry into hard shapes. The form of the face is a clay mold or outer shell of a large gourd. The horns are another mask tradition and are usually bull or cattle molds. This celebration in Ponce is known for plena music, parades and also Shrove Tuesday or Entiero de la Sardine. This is a mock funeral with drag queens as mourners and others crying for the death of the Sardine which is buried because of Lent. A coffin carrying a dummy is set on fire to symbolize the burning away of the sins of the flesh. If you are looking for fun and excitement mixed with history, traditions, and culture, perhaps you should plan your next exciting vacation during the time of the Carnival of Ponce and The Festivals of St. James the Apostle. You will certainly want to experience the unique vejigante de Ponce as well as all other famous characters that make these festivals rise to greatness year after year.